Since their invention, markers have been considered a tool for writing or for quick sketching and concept art. Compared to other art mediums that have a rich history of use, markers are relatively new on the scene. They weren't even commercially available until the 1950's. However in recent years, the marker has become a viable medium for drawing. Inks have become more permanent and surfaces have been developed specifically for use with markers. Manufacturers have now developed markers that are capable of producing quality art. Professional markers feature dye-based inks that are delivered through a porous tip. Tips are chiseled, pointed, or fashioned as a brush. The solvent used is alcohol-based which is a safer alternative to earlier versions of the marker in which harmful chemicals were used. The surface in which markers are applied greatly influence the marks that are made. Markers have a tendency to bleed on traditional drawing papers. This characteristic can be a benefit or a hindrance depending on the effect that you are looking for. For cleaner shapes of color and value, papers specially designed for use with markers may be a better option. These papers are very smooth, thin, and some are semi-transparent. The intensity of the color delivered can vary according to manufacturer. Higher quality markers, such as Prismacolor Premier or Copic produce even applications of color with consistent stroking. Additional layers of color can applied over the top of applications darkening the value or altering the color. Although mixing doesn't happen on a palette, it can occur on the surface. By layering a blue over an area of yellow for example, the resulting color may appear green. This type of mixing is usually referred to as optical color mixing. Once colors have dried on the surface, it is difficult to alter them. However, by working quickly, blending can occur. If marks are made before the solvent has dried, transitions of value and color can be developed. Blending markers, which lack pigment, are also available. Blending markers can be applied over applications to ease transitions of color and value. The term underpainting generally refers to a preliminary painting of values in which colored applications are made over the top. The values developed in the underpainting show through and influence the colors that are applied during the final steps. Working in this manner allows the artist to concentrate on just the values in one step of the process and then the color development in another. With markers, creating an underpainting is especially helpful since mixing is heavily dependent on how the colors are layered. Since markers are semi-transparent, colors and values can be developed in stages producing additional complexity in the color. Like with watercolor painting, we'll start with the lightest values and progressively develop the darker ones. 20% Warm Gray is used initially to develop the lightest tones on the subject. This color is applied in the areas of darkest value as well. Once applications of the lightest tones are in place, we can move on to a darker value. In this case, 50% Warm Gray is next applied. Again, all of the darkest locations are addressed. With medium to darker values in place, we can move on to developing the darkest values on the subject. 70% Warm Gray is applied in these locations. With our underpainting developed, we can focus on the color. In this example, the goal is to exploit a complementary color scheme made of orange and blue. Since blue is the cooler color in this relationship, we'll add it over the areas of shadow but allow it to overlap some areas of lighter value and midtone. Light Cerulean Blue is used for these applications. We'll next develop the warmer hues by adding Cream, Light Peach, and Deco Pink in the areas where light is hitting the skull. These applications overlap the blues in areas to create more complexity and produce a drawing with a bit more interest and color. 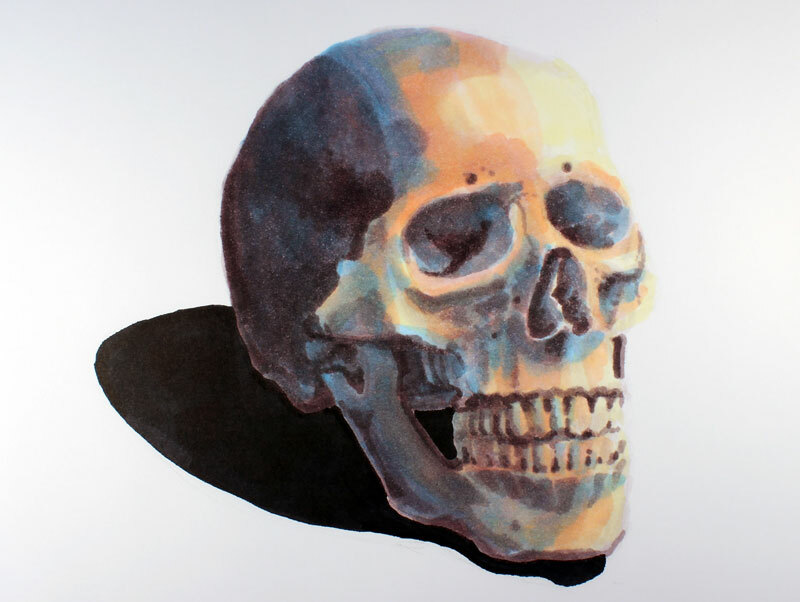 To finish the drawing, an area of cast shadow is added below and underneath the skull with Black. In this lesson, we took a traditional approach to creating a drawing with the relatively new medium of markers. Markers, like any other art medium, do require a bit of practice and patience - but they make a great medium for planning out ideas and even for creating polished works of art.